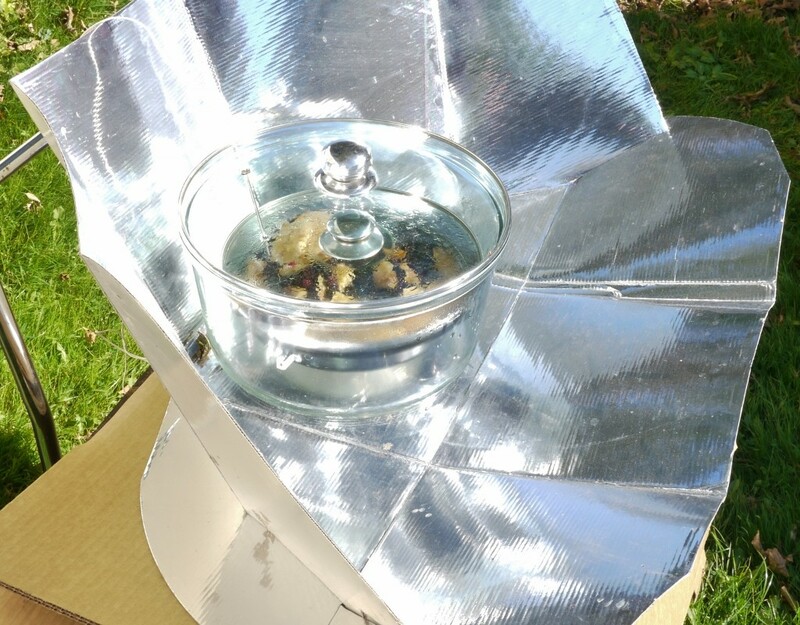 The SLiCK CooKit Solar Panel Cooker is a good entry point for solar cooking in the UK. They are inexpensive, and fold quickly for easy storage. Cooking pots must be black or dark in colour, and pots should have a reasonably tight lid. A microwave bag (included) will cover most pots and this serves to keep more of the sun’s heat in your pot. Success depends on the type and amount of food cooked, and the number of sunshine hours. It’s possible to get cooking pot temperatures above 100C, but you will probably see a maximum of around 95C most of the year in the UK. Maintained for three to five hours, this is easily hot enough to cook vegetables and even tenderise tough cuts of meat in the same manner as an electric slow cooker. A CooKit can be one component of an ‘Integrated Cooking Approach’ (see our article on Integrated Cooking on the resources page) Combined use of a rocket stove, a solar cooker, and a ‘wonder bag’ or ‘hay box’ (fireless cooker) can seriously reduce your fossil fuel consumption. A CooKit can also provide batches of warm water for washing up, It will easily heat water to 60C on a sunny day – hot enough to scald you – be careful. With a CooKit, best results are achieved between the equinoxes, but we have used them to cook well into October – see our Blog. If looked after, they will last you for several summers. When completely exhausted they make a great template for making as many as you like. Make sure that you protect yours from rain, though, as they have a cardboard backing. 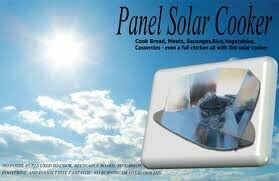 We can recommend the CooKit as an educational tool and a good introduction to solar cooking. 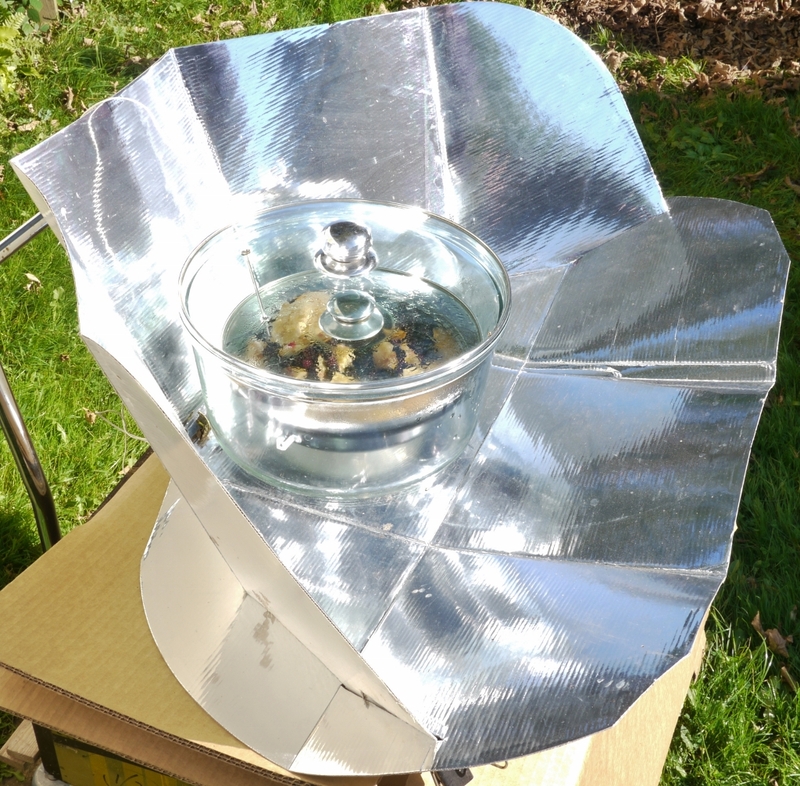 Solar cooking is in its infancy in the UK, so your use of a CooKit will raise consciousness of low carbon cooking, and provide a hands-on demonstration of the greenhouse effect, and the amount of power available from the sun. 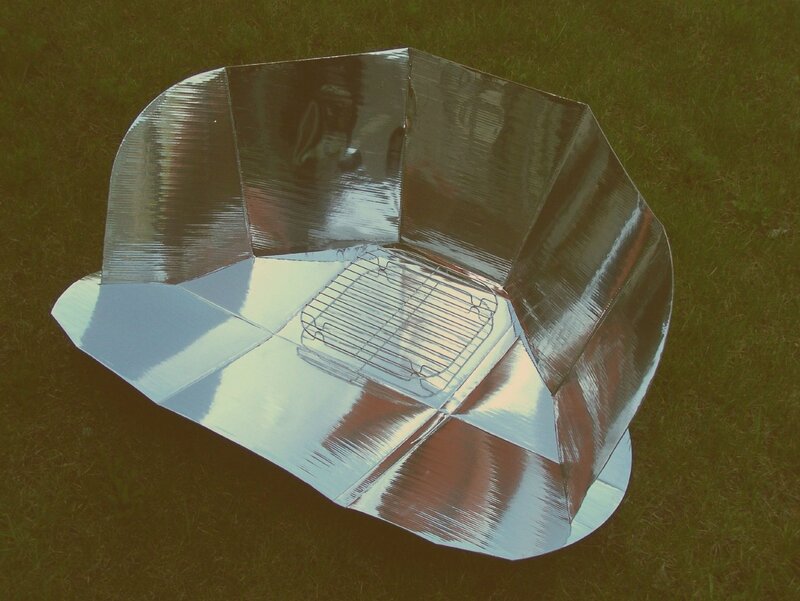 You can explore your own Solar Cooker recipes, or copy ours. 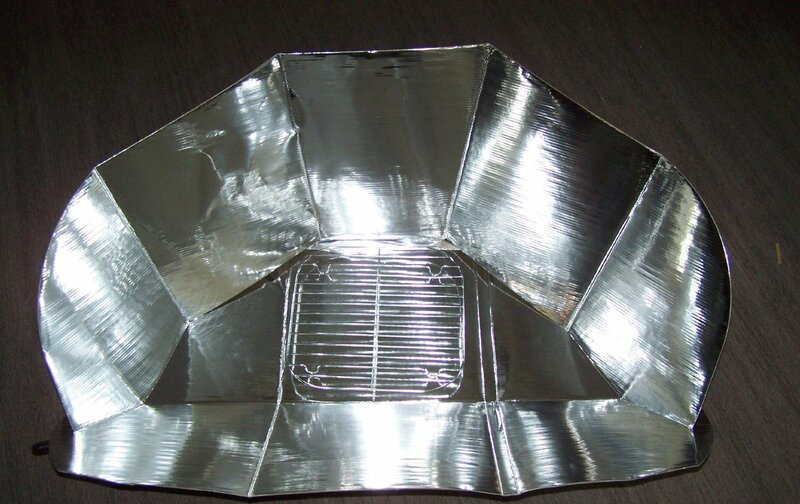 Note: The Solar Panel Cooker does not include the grill trivet or glass bowl shown or cooking pots. Collect your own pots which need to be black, black cooking silicon works very well too. It’s 16th May 2014, and we have just had a day of wall to wall sunshine here in the South West. These cookers are a UK made version of the CooKit, which is a simple solar panel cooker widely distributed in third world countries where there is little money for fossil fuels, but plenty of sunshine. With the right amount of sunlight, it can be used to cook, or to sterilise water. If you Google ‘CooKit’ you will find a wealth of information about ingenious design modifications, and international projects to make use of this appropriate technology in poverty stricken areas and in refugee camps. But we are over 50 degrees north of the equator in the UK, and nobody would call this a ‘hot country’, so how effective can one of these be up here towards the north of the globe? We decided to test one. The cooker only takes a couple of minutes to unfold and arrange in the configuration you see in the picture on this page. I would recommend you do this with you facing the sun, and the shiny side of the panels facing you. For obvious reasons they are very reflective, and it’s unpleasant to have the sun reflected into your eyes. You should really wear UV blocking sunglasses when you do this, to keep you eyes as safe as possible. The front panel, the one on the ground nearest the camera in the picture you see on this page, needs to be pulled up at an appropriate angle once the cooker is facing the sun. We used bulldog clips to hold it in place as it will not stay put unless you do. We began our first experiment at around 11.00 today to get an idea of what sort of power is available, and how easy it is to use this power to cook. You can do all the theoretical calculations you like, but measuring how long this device takes to heat a litre of water gives us quite a lot of information. We used a black aluminium pan with a black non-stick interior surface, and a glass lid. This was placed on top of a small trivet inside a large pyrex bowl with a glass lid. One litre of water was added to the pan, and a heat-proof thermocouple type thermometer (like a meat thermometer) was placed in the pan. The temperature of the water was logged every minute for half an hour. At around 20 degrees C, when the temperature of the water was increasing at its maximum rate, the temperature rose four degrees in two minutes. I won’t bore you with the calculations (unless you ask) but this shows that this set up was delivering around 150 watts of energy to the water. If you take a look at the slow cookers on the market, you will see that their power ratings range between around 100 and 300 watts, so we could regard this panel cooker as a slow cooker. Anything you can cook in a slow cooker could be cooked in about the same amount of time (probably between 4 and 8 hours) with this solar cooker … on a sunny day, of course. We then decided to cook some vegetable soup. Beginning at about midday, it took just over four hours to cook one litre of thick vegetable soup. We used the same set up. The panel cooker needs to be rotated from time to time to face the sun again, but his only really needs to be done every one to two hours, so you can forget about having to watch what is cooking, and go off and do other stuff. Before we ate the meal, I used the probe to test the temperature inside the pot. I did this several times in different places to see whether the temperature was consistent. All readings were between 96 and 99 degrees Centigrade. So, if it’s going to be sunny for the best part of the day, and you have one of these, and some black cookware (the lighter – i.e. less heavy – the better) and a small trivet, you could cook anything you would cook in a slow cooker between May and August in the UK. You don’t need the large pyrex dish we used, many people just put their cooking pot into a clear microwave bag. You can find acres of detail about using these on-line, and lots of recipes. I did not get ours on Amazon, as it is available more cheaply elsewhere, once you factor in the postage. These will not be durable if you get them wet, as the shiny surface is stuck onto a cardboard backing. With care I would expect one of these to last several years. They are very light, and they fold flat, so you could consider taking them car camping. You can easily make your own, of course, much more cheaply, using shiny plastic or aluminium foil. The design of the CooKit is in the public domain, and you can download a template. it depends how you value your time. This seems a little expensive for what it is, but if you don’t want to get glue and sticky backed plastic on your hands, it is cheap enough. Finally, it’s unlikely that you could use one of these to save money on your fuel bills in our climate. I estimate that it provided us with less than 1 kWh today. If we had got out into the sunshine earlier, we might have got a whole kWh over the course of the day. At the time of writing, 1 kWh (1 unit) of electricity costs around 17 pence. A friend of mine who solar cooks in the UK estimates that there are about 40 to 50 days each year when it is worthwhile trying to produce a meal with an unattended solar cooker. So, if you used every available opportunity to cook with this, the ‘payback period’ would be two summers. So don’t get one to save money. Get one to have fun, and to feel the little surge of green smugness you will experience when you realise you have produced your meal using renewable energy.